The spiny lobster (Panulirus argus) is a crustacean related to crabs, shrimp, crayfish and the Spanish lobster. Common names include crawfish (this is not the freshwater crawfish) and Florida lobster. In Florida, the spiny lobster is caught off the Keys and around the southern tip of the state from waters of the Atlantic Ocean near the Florida Reef Tract. The spiny lobster is characterized by numerous spines on the body, two large, hooked horns over the eyes, a pair of long jointed antennae and five pairs of walking legs. It has mottled coloring of yellow, brown, orange and blue markings over the body and tail. 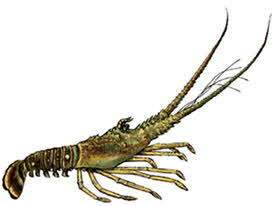 The tail is segmented and can be rapidly curled under the body to propel the lobster backward. Like all crustaceans, the spiny lobster molts or sheds its shell to grow. Its diet consists of clams, snails, seaweed and small marine organisms. Lobsters form a single line, called "marches," and move from shallow to deep water during seasonal migration. Spiny lobsters are harvested using special traps at depths of 6 to 300 feet and are usually landed live. They are marketed as whole lobster, lobster tails, split tails and lobster meat. These products are available fresh or frozen, raw or cooked. The term "green" is used to refer to raw lobster. Coarse texture, white meat with sweet distinct flavor. Low fat. Blue Crab, Golden Crab, Rock Shrimp, Shrimp. · Spiny Lobster in shell: 1 pound per serving. · One pound of raw lobster will yield approximately 1/3 pound of cooked lobster meat. · Remember to purchase seafood last and keep it cold during the trip home. · Spiny Lobsters should have some leg movement when handled. · A lobster should curl its tail when picked up. · Refrigerate at a constant 41 degrees F in a breathable container (a bag or cardboard box). · Do not store directly on ice. adhering shells and firm flesh. · Store them in the coldest part of your refrigerator at 32 degrees F and use within two days, or freeze at 0 degrees F for up to six months. · Keep raw and cooked seafood separate to prevent bacterial cross-contamination. · After handling raw seafood thoroughly wash knives, cutting surfaces, sponges and your hands with hot soapy water. · Always marinate seafood in the refrigerator. · Discard marinade; it contains raw juices which may harbor bacteria. · When marinade is needed for basting reserve a portion before adding raw seafood. · Whole lobsters: place head first in to boiling salt water. Return water to boiling and simmer for 12 to 15 minutes. · Lobster tails: same as whole except reduce cooking time to 5 to 10 minutes, depending on size. · The shell of a spiny lobster turns a bright red-orange when cooked. · To heat cold cooked lobster: place whole lobster or tails on a rack over a small amount of boiling water in a covered saucepan or steamer. (Do not immerse rack in water.) Steam just long enough to heat thoroughly. It is industry practice to package frozen lobster in plastic bags. The practice is to protect the product from dehydration and freezer burn. Some others apply a thin coat of ice over the frozen lobster. This thin coat of ice is referred to as "glaze." When the thin coat of ice is excessive and you are charged lobster price for the ice, it becomes mislabeling. The net weight listed on the box must be the weight of the product. For example if the net weight of the package is 10 pounds, then the "unglazed" weight of the product must be 10 pounds. For weighing purposes, the product should be rinsed only long enough to remove the glaze. It should also be noted that many seafood products including Florida lobster continue to lose weight after thawing, therefore most seafood should be cooked as soon as possible after thawing. If you suspect products you purchased are mislabeled, contact the Florida Department of Agriculture and Consumer Services, Division of Food Safety, at (850) 488-3951.